What will India look like 20 years from now? What about 50 years into the future? A recent volume of essays, commissioned by McKinsey and Company, explores the future of India in the 21st century as one of the world’s emerging powerhouses. Recently a group of key figures in the Indian and Australian business communities, including the Consul-General of India, Sunjay Sudhir, came together to discuss the challenges and opportunities facing India and its sizeable population. 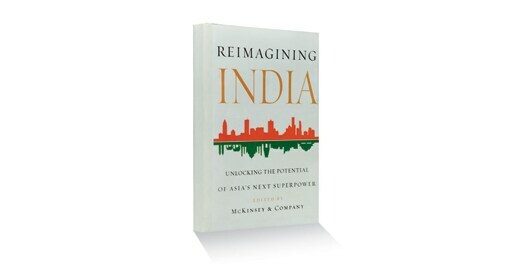 The event, co-hosted by McKinsey and Company, Asia Society Australia and the University of New South Wales, marked the Australian launch of Reimagining India: Unlocking the Potential of Asia’s Next Superpower. The book is a collection of opinions and ideas from some of the world’s great thinkers. Each of the 65 essays explores different facets of India’s development, in terms of its rising economy and burgeoning middle class, and takes on everything that is right – and wrong – with the country. The articles also examine the fusion of modern and traditional cultural elements, and the changing nature of politics in the largest modern democracy. Co-Editor of Reimagining India Adil Zainulbhai began the evening by outlining how India and its leaders must take a long-term perspective and explore the potential of India beyond pure economics. Senior Adviser to McKinsey and until recently Chairman of McKinsey India, Mr Zainulbhai continued by saying India will persist in improving the standard of living for its people and how the ubiquitous spread of technology is accelerating this process. With two-thirds of the population under 35, “the large number of young people coming into the workplace will have a huge impact on the economy and politics of India,” Zainulbhai said. A featured panel discussion, moderated by UNSW Vice-Chancellor Professor Fred Hilmer, saw experts including Sunjay Sudhir, Consul-General of India, Neville Roach, the Patron of the Australia India Institute at UNSW, Deborah Hadwen, CEO of Tata Consultancy Services, and Graeme Barty, Austrade’s General Manger of Growth and Emerging Markets, considering the significant opportunities in India for Australian business and innovation. India currently has the world’s best performing stock market and is earning a place alongside China as one of the world’s indispensible economies. As Consul-General Sunjay Sudhir said, the strength of the Indian economy lies in its resilience, entrepreneurship and being unafraid of risk taking. India is the second largest source of overseas students to Australian universities, making it a key market. Neville Roach proposed that Australia further develop its relationships with India in the education and research sector in order to facilitate an exchange of knowledge and skills, and capitalise on new business opportunities. Professor Hilmer agreed, saying, “Education is a microcosm of the larger story of this book, which is the achievements of India, its potential and the unanswered questions”. The rapidly changing demographics of India, along with its innovation in technology and increasing urbanisation, continue to make this country an exciting possibility for Australian industry and investors. Graeme Barty summarised how Australia can seize its comparative advantage in certain industries in order to create change. He suggested these areas include dairy services, coal mining, long haul freight rail, energy efficiency and the implementation of cultural precincts. He also outlined how Australia, a world leader in road safety, can assist India in reforming its urban infrastructure. “More Indians are killed in road accidents than from malaria and typhoid combined,” Mr Barty said. As Neville Roach suggested, reimagining the state of India is about changing attitudes and aspirations. It is as much about social change as it is about the economy. This book provides a radical new vision of India where “Australia can turn for leadership and ideas in a relationship of mutual respect”. Reimagining India includes contributions by influential thinkers from India and across the globe including businessmen, economists, cricketers, journalists and artists. High profile contributors include people such as Bill Gates, CNN’s Fareed Zakaria, businessman Anand Mahindra, and Google chairman Eric Schmidt. Each shares their unique insights into how India might forge a better future. As one of the contributors to the book, Anand Mahindra, Chairman of the Mahindra Group wrote, “Much of the developing world faces the same challenges India does. The solutions developed (there) – the answers to the most metaphysical questions about how societies should work and grow – will have worldwide relevance”. Kira is the Assistant Editor of Indian Link. She has a passion for politics, and enjoys puzzles, bad jokes and cuddles with her cat. This book is a smorgasbord of 60-odd essays about India. It is the result of leading management consulting firm McKinsey & Company deciding to do a reprise of its Reimagining Japan: The Quest for a Future that Works (2011), on the completion of 20 years of its India practice. McKinsey could not have picked a better time as the world and Indians themselves ask questions about whether this country will ever realise its promise. The book's strength is its tremendous range and the diversity of its authors and themes. Contributors range from Eric Schmidt to Madhav Chavan, Naveen Tewari to Suketu Mehta, Nitin Nohria to Viswanathan Anand, Mallika Sarabhai to Bill Gates, Edward Luce to Mukesh Ambani, and Suhel Seth to Vinod Khosla, to cite a few. It is an amazing anthology of experiences, thoughts and insights about India that has likely never been attempted before. Essays are organised into six sections that include politics and policy, business and technology, hard and soft infrastructure challenges, culture and soft power, and much more. In addition, there is an opening chapter on India's identity, and a closing one on India's place in the world. With every essay you are invigorated enough to want to move on to the next, in anticipation of finding something new and different - forcing you to mentally shift gears as well each time, but also allowing you to savour a new thought or an "inside story" you never knew - much like tasting the variety of items in a traditional thaali. All the authors take great pains to explain the context of India and how we got where we are. That in itself is valuable. A certain commonality is visible in their view of the country's past - its origins, its sense of being a civilisation, its colonial and Mughal legacies, its freedom struggle, its democracy experiment. There is consensus as well about how it has stayed together as one country, the struggle for survival as a new nation, the border wars, the Indira Gandhi years, the economic reforms, the rise of the states, the mobile and IT booms. The demographic dividend, the attitudes of the youth, the consuming middle class, and the untapped potential of the country are taken up too. So are all the country's problems looked into? The challenges of governance, inclusiveness, health, education, the environment, sustainability, security, infrastructure and urbanisation show up again and again. It is interesting to read different takes on the same issues - they are diverse, elegant and insightful. Of course, every essay also makes a case for what needs to happen or to be done to realise India's potential. What I found most interesting and charming was that some of the essays were also sometimes personal. When Howard Schultz writes emotionally about Starbucks' entry into India, or Kumar Mangalam Birla recounts the story of introducing non-vegetarian meals at his cafeterias as his group went global, or Rohini Dey talks about leaving her "brand name" PhD and job to start a restaurant dhanda, it is fascinating to read. These essays are as much about their authors as about their views on India. Overall, the essays are optimistic and inspiring. In the end, while they all exhort, expect, hope that India must, should, could, needs to do what it takes to unlock its potential, they really don't address the nub of the issue - why this it not happening and how it can be made to happen.